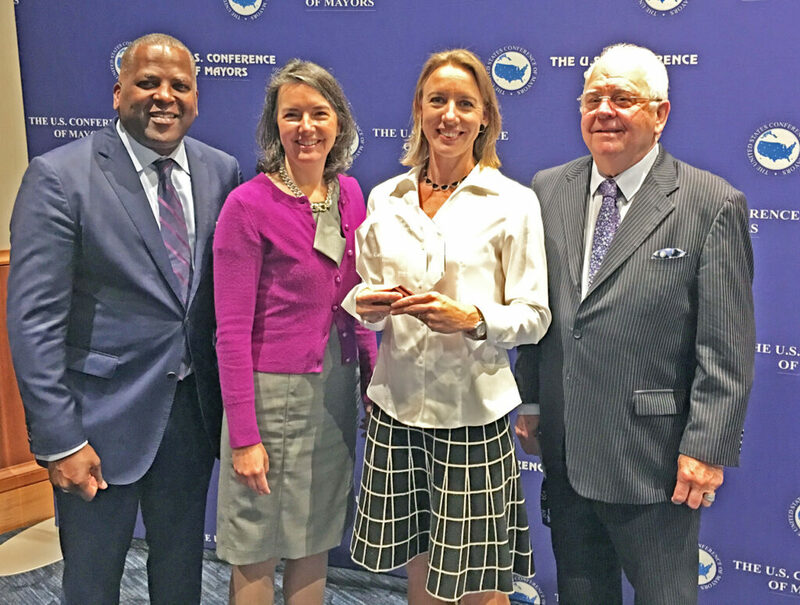 I’m fresh from the 86th annual U.S. Conference of Mayors in Boston where the City of Encinitas was honored with an award for our “Gold Standard Climate Action Plan” (see photo below). What an accomplishment to have our program highlighted in front of such an esteemed group – 250 mayors from across the country! Here’s the Coast News article on the Climate Award with more details about the Climate Action Plan itself, and here’s the Encinitas Advocate article highlighting the importance of the award. Mayors serve and shape their cities and I found this conference, which was aimed at the executive level of leadership, to be outstanding. Not only did we have panel discussions about topical issues such as “Next Steps for Homelessness Policy,” but the meeting also featured accomplished speakers such as Sheryl Sandberg, the COO of Facebook, U.S. Senator Elizabeth Warren, two poised students who survived the Parkland shooting, and the Mayor of Hiroshima, Japan, talking about nuclear threats. 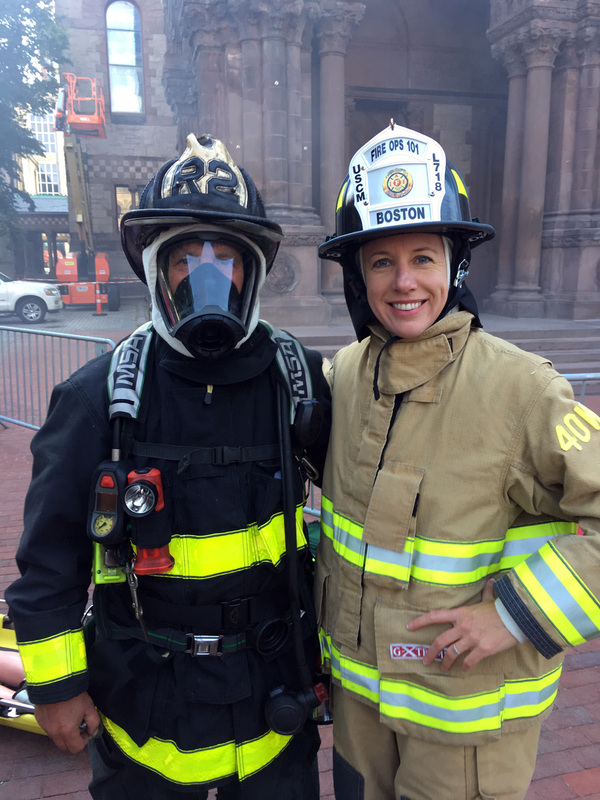 I was also thrilled to participate in a “Live Fire” scenario organized by the Boston Fire Department and others, that offered mayors the chance to experience what it’s like to be a firefighter. I strapped 45 pounds of gear and an oxygen tank onto my back and, together with one firefighter, entered a sealed building. Dragging a very heavy firehose, I blindly crawled along the floor in the dense smoke until I encountered flames. After dousing the fire, I squirmed into the next room, firehose and all, where yet another raging fire was waiting to be extinguished. What a job firefighters have! Here in Encinitas, I’m glad we have strong, trained men (no women in our fire department – yet!) who are willing to risk their lives for us. It was heart-pounding, scorching and impossible to communicate inside that mock burning building! This was an experience I’ll never forget, and one that inspired a deeper sense of appreciation than I already had. • I’m always working to improve the effectiveness of the City Council as a group, so I split last Wednesday’s meeting into two sessions to tackle some of our pressing issues, starting at 4 p.m. instead of the usual 6 p.m. It’s hard to be at our best when an intense meeting continues long after after 10 p.m., and I think moving up the start time effectively managed this reality better. We were able to efficiently cover a wide-ranging agenda, including approval of the city’s operating and capital budgets, extending our porta-potty and washing station program, and adding more frequent sidewalk cleanings downtown. • A plan for artwork underneath the Santa Fe Drive and Encinitas Blvd. freeway interchanges was also approved at the meeting. The old sloping embankments underneath those bridges are being converted into vertical retaining walls to make room for new protected bike and pedestrian paths. Along these new walls, we’ll be able to enjoy some new public art. At the Santa Fe interchange, the City Council approved a plan to have 53 three-foot by five-foot mosaic panels (seen in the artist’s rendering above), and the Encinitas Blvd. interchange will feature a three-foot high continuous horizontal ribbon on each side. I’ve been serving on a subcommittee with Councilmember Tony Kranz, two art commissioners and city staff to shephard this public art forward. I’m grateful for everyone’s contributions. • Our Council meeting’s heaviest policy item related to what’s called the Inclusionary Ordinance, which is the number of affordable homes that we require developers to build when they build market-rate projects. We are moving forward with an ordinance that will require developers who build more than seven units to set aside 15% of them to be deed-restricted affordable for lower income residents. This is an increase from our existing policy requirement, which is that when a developer builds more than 10 units, 10% of them are deed-restricted affordable. By law, we can’t require more than 15% without doing an “economic feasibility study,” which we authorized doing. If you’d like more information on this technical subject, help yourself to our agenda report here. And an Encinitas Advocate article about the change is here. • Another agenda item involved the annual City of Encinitas and Mizel Family Foundation Community Grant Program allocation to support organizations creating local projects and programs. This year, 53 arts and civic nonprofits submitted applications for grants of up to $5,000, to be awarded from $150,000 in available funds. Half of the money comes from Encinitas taxpayers and the other half consists of matching funds from the Mizel Family Foundation. Thank you to both donors! We approved the recommendations made by the committee and were able to allocate an additional $1,000 each to the six organizations that had received no funding but came to the meeting to appeal that decision. We’re grateful for the many organizations in our community that create important events and engagement opportunities, and to the Mizel family for their ongoing generosity. The staff report is here. • Next Wednesday is the first reading of the housing plan that we’re taking to the voters in November. The Planning Commission heard more than 60 speakers on this item when they deliberated it. Our meeting starts at 6 p.m. at City Hall. We’ll take two minutes of public comment per speaker, allowing one time donation of two minutes, so each person will have a maximum of four minutes. There’s a strong new candidate, Jody Hubbard, for City Council running to represent District 3, which includes Cardiff. She’s currently Cardiff’s Planning Commissioner. Here’s a great Coast News article about her background and interests. 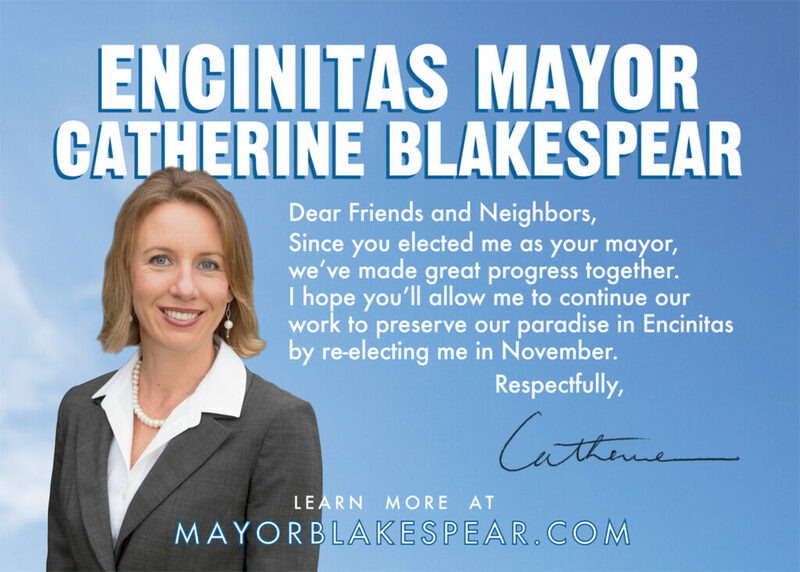 • Speaking of elections, this Coast News article covers the recent announcement of my reelection bid for mayor of Encinitas. • And finally, this article in the San Diego Union-Tribune about my aunt Rosemary KimBal’s art and her approach to painting with giant brushes captures her creative magic! As always, thanks for your interest and participation in our local government. I hope your Encinitas summer is starting out well!